The Ninagawa Company, under the stewardship of Yukio Ninagawa, has built up a fearsome reputation in world theatre. They stand as the equal of any post-war company from Joan Littlewood’s Theatre Workshop through to Chicago’s Steppenwolf, whilst stylistically they are as uniquely identifiable as anything from Peter Brook or Simon McBurney. 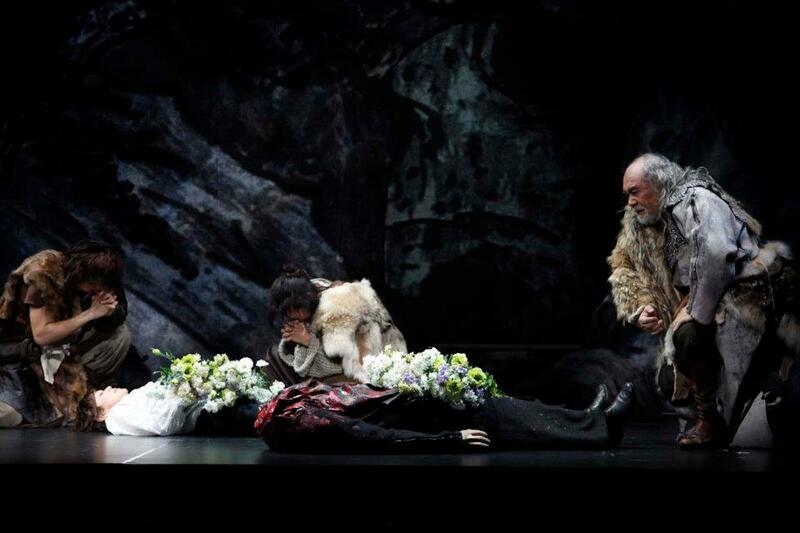 Famed for his Shakespeare, Yukio Ninagawa has turned his attention to one of the most problematic plays in the Bard’s canon; Cymbeline. It is a difficult play to love and one that comes packaged with all kinds of traps for a modern audience. The plot winds and winds and seems unsure of what it wants to be, containing elements of romance, farce and tragedy. It has simplistic plot devices, like cross-dressing and misidentification, reminiscent of earlier plays but also contains the heavily allegorical language and non-human elements, in this case Jupiter descending on an eagle, that place it alongside The Winter’s Tale and The Tempest as one of the later plays. Frank Kermode described the play as a tragi-comic romance and suggests that it may have been an in-joke for audiences who would have had a much better understanding of the text and references to earlier plays. None of which makes it any easier for a modern audience to unpick the complexities of the plot. Luckily going to see a Ninagawa production is to have your visual senses wrapped in cotton wool and taken on a journey where the simplicity of images masks the masterful craftsmanship working behind the scenes. The technical understanding of balance is superbly illustrated again and again throughout the evening; light and shade, simplicity and complexity, the tonality is in harmony so that everything works towards the whole and the audience is never aware of the mechanics. Like other Japanese traditions that have bewitched Europeans over the years, from woodcuts to sushi, the skill rests on the ability to hide an incredible complexity behind a deceptively simple front. It is difficult to fairly assess the skill of the actors without speaking Japanese and since the production leans so heavily on the visual, the rest of this review will take a radical detour and will look to provide a sense of the evening through the images it has left behind. You can choose any one of a number of plot strands to call the centre of Cymbeline. Above we see the romance at the heart of the play, that of Posthumus and Imogen, as they are parted and again as they are reunited. As is traditional in Shakespeare the lovers must face many barriers before finally winning through in the end. However the play is made problematic, particularly to a modern audience, by the fact that Posthumus acts in such an unreasonable manner for much of the play, doubting his wife’s fidelity almost as soon as he leaves England before hiring his servant to murder her. That kind of level of trust does not always lead to happy relationships. Above we see Belarius, (imagine something near to a Japanese equivalent of Brian Blessed) and his wards, mourning Imogen, alongside the beheaded Cloten. In a sign of the strangeness of the play, part of the farcical element rests in Imogen misidentifying Cloten as Posthumus and imagining him dead, which is hardly suggestive of a laugh riot. This still is typical of Ninagawa’s style. Its power rests in its simplicity. A battle charge is stripped to its essential elements of king, banner and action. 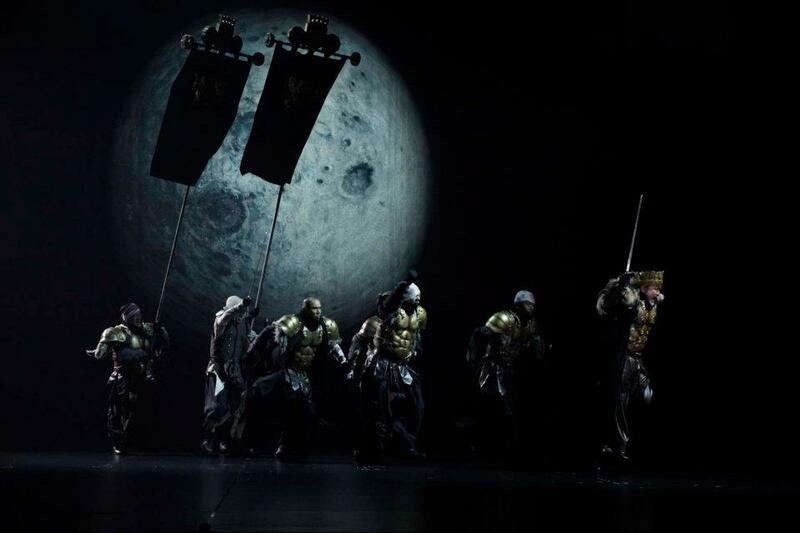 The moon, a key element throughout the production, provides a backdrop to an otherwise bare stage, whilst subtle lighting creates a moonlit scene that accentuates the action by muting out all the colours bar the golden armour and the glimmer of light catching a steel blade. 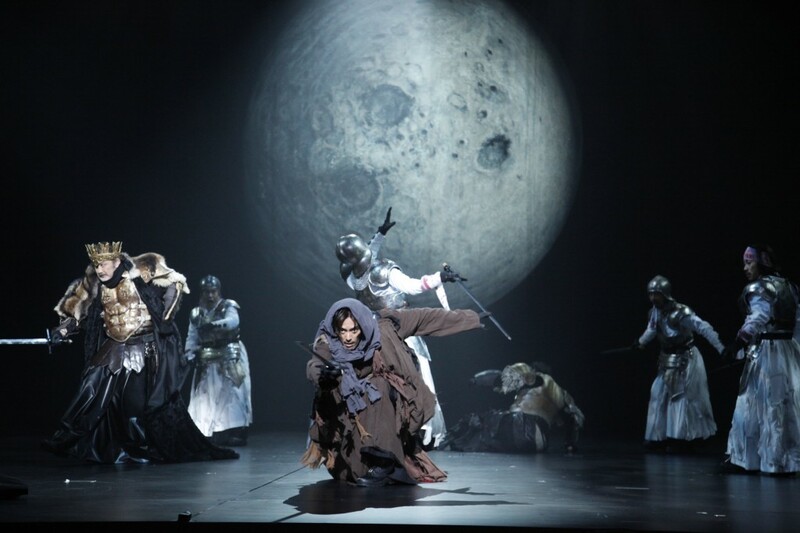 Ninagawa has managed to create the sound and fury of war without requiring the use of either sound or fury. It is an excellent example of the skill needed by all creatives- to show and not to tell. The second central relationship in the production is that of Posthumus and Iachimo. 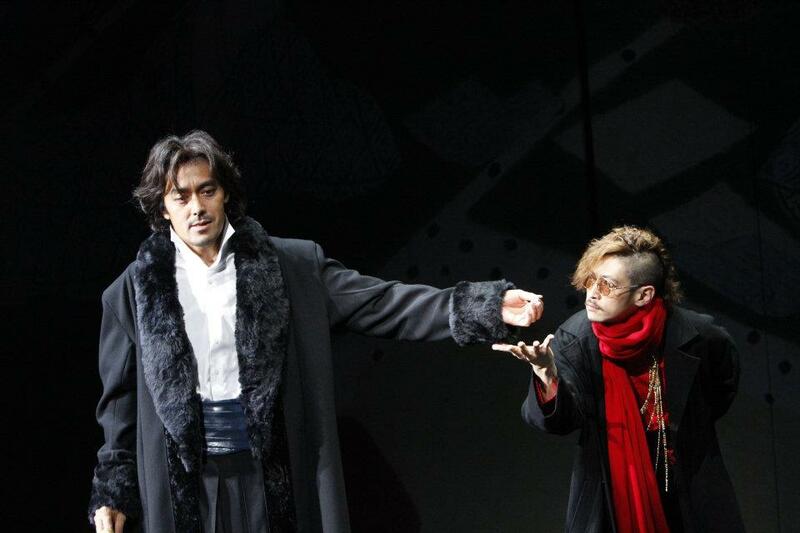 It is Iachimo’s goading of Posthumus that triggers a number of the play’s key plots. Iachimo is played with a certain amount of relish by Yosuke Kubozuka, and has clearly been given licence to play the malevolent meddler with a darker intent than is often done. The wager can be read as friendly rivalry that has got out of hand but here it seems that Iachimo sets out to deliberately goad Posthumus into action. Iachimo’s scenes with Imogen provide some of the most visually impressive moments of the play – again made transcendent in their quietness. The scene where Iachimo steals into Imogen’s room makes masterful use of the way a gauze curtain masks our certainty and possibly is a knowing reference to one of cinema’s great bedroom scenes; F.W. Murnau’s Nosferatu. The use of light and shade is also beautifully demonstrated in the scene where Imogen rejects Iachimo’s advances and crosses the stage flinging open the castle doors to let bursts of light flood the room. The transition from dark to light is handled exquisitely and the white light relief emblematic of Imogen’s purity. 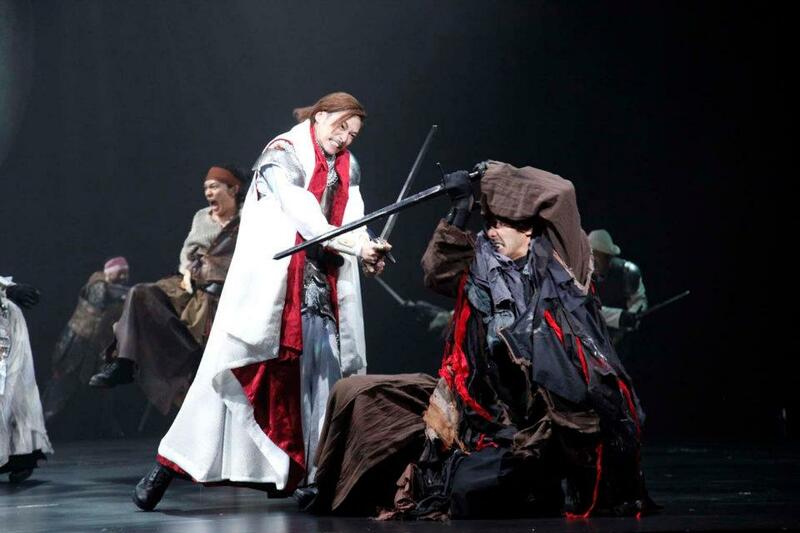 Full scale battle scenes are notoriously difficult to stage and Ninagawa resorts to the stand-by of slow-motion stylised action, drawing on the relationship between dance and fight choreography. The balletic motions are enough to carry the audience through the unreality of the action. The surreal nature of the images is well-placed as the confusion of the war is compounded by the confusion of plots fusing together in one scene – with the returning Posthumous, the Romans, Iachimo, Imogen (in disguise), Beralius and his wards meeting Cymbeline and his army. It is impossible to fully do justice to the grace and beauty of the staged battle in still images but it deserves to be recognised as the most striking element of a visually mind-blowing production. 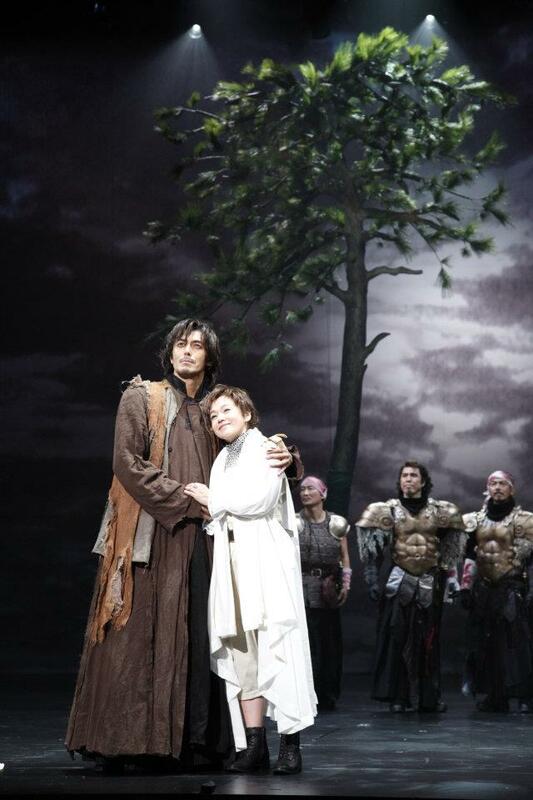 It also needed to be as this was a production with very few cuts and a running time well over 3hrs. The battle is a much needed inducement to prepare the audience for the inevitable wrap-up scene that, at 485 lines, must be one of the longest in Shakespeare. It is fair to say that by the time Cymbeline calls on the Soothsayer to solve the riddle of the prophecy there is a restless feeling in the auditorium. Cymbeline may never be considered one of Shakespeare’s great plays and, if we are being honest, may be as close to a dud as it was possible for Shakespeare to write. However the advantage of being the world’s most revered playwright is that you will have theatre troupes as skilled as the Ninagawa Company looking to bring your work to life. 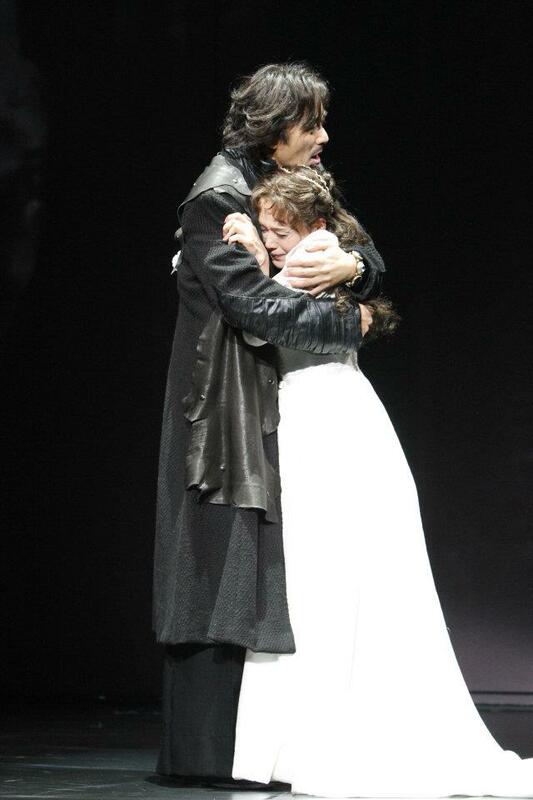 The Company could well have as come as close to anyone can in presenting a working Cymbeline. It may be subject to the criticism of style over substance but if the substance is questionable to begin with then this reviewer has no problem with them focussing on the style, particular when the style is so ravishing and accomplished.